Paddle boarding has been taking the outdoor water sports world by storm. Ever since it exploded onto the scene several years ago taking the place of the then popular kite surfing, it has been the activity of choice for water sport enthusiasts of all stripes. It’s a great activity for people of all levels but it’s especially appealing for beginners because there’s not really a special skill set required before you get started and there is relatively little in the way of gear that’s required to get set up. That being said, choosing a board can be quite a daunting task especially when first starting out. Just want the bottom line? Click below to paddle straight for the good stuff! Or click HERE if you already know which inflatable paddle board is right for you. 1 Why Buy an iSUP? 2 Which iSUP is Right For Me? Portability– No need to worry about how to strap it down to your car or where you’ll store it when you’re not using it. Most inflatable stand up paddle boards deflate to the size of small sleeping bag when you’re done with them. Price– Inflatable paddle boards can be 50-75% cheaper than their solid construction cousins. When you’re new to a sport and trying to decide if you even like it, getting started for as cheaply as possible is hugely important. That way, if you decide you don’t like it, at least you won’t have spent a ton of money on gear you’re no longer using. Durability– Believe it or not, iSUPs are often more durable than traditional SUPs. Other SUPs are prone to dents, scratches, and punctures. Inflatable paddle boards can be dropped, run over with your car, or run into sharp rocks or other obstacles while paddling and still look and perform the same as the day you bought it. Now that we’ve gone over the basics of what sets inflatable stand up paddle boards apart from the rest, let’s take a look at three of the best iSUPs on the market today. Which iSUP is Right For Me? There are, of course, dozens of inflatable paddle boards on the market but after extensive research, we’ve narrowed it down to the top 3 best iSUP paddle boards for your money. ISLE has become known as a consistently top manufacturer of quality SUPs. Their iSUP is no different. Like their other products, ISLE offers their iSUP as part of a package so when you purchase one of their inflatable paddle boards, you also get a carry bag for your board, a manual pump, one travel fin plus repair kit, and a 3 piece aluminum adjustable paddle. Impressed by what you saw? Click here for a great deal from Amazon! ⚠️ Product Alert: The ISLE Airtech is currently unavailable on Amazon. I have reached out to the manufacturer to determine whether or not it will be restocked or not. In the meantime, the recommended product is the PEAK Inflatable Stand Up Paddle Board. It’s an excellent, yet affordable, inflatable SUP. 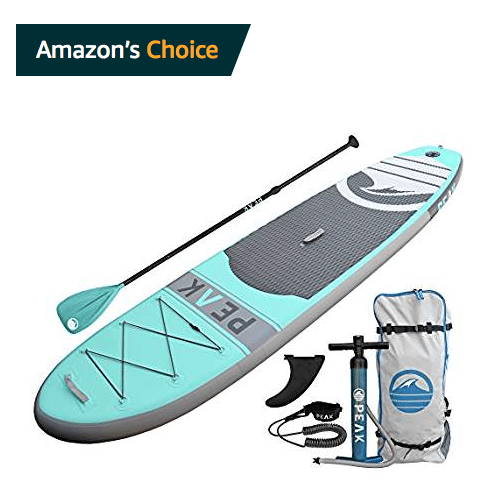 With almost entirely 5-star reviews it is “Amazon’s Choice” for inflatable paddle board and I fully endorse this product as well. Should the Airtech be discontinued, I will update this page with a full review of the Peak paddle board. You can check the price and find out more about the ISLE PEAK Paddleboard here. If you’re still exploring your options for inflatable paddle boards, I suggest you check those articles out as well! Basically, everything you need to go paddle boarding fits in the seat of your car and can be carried on your back! The ISLE Airtech iSUP is constructed out of military grade drop stitch PVC which offers supreme durability. ISLE even offers a 2 year warranty on their product to give total piece of mind that their inflatable stand up paddle board is every bit as durable, if not more so, than a traditional epoxy/resin board is. Part of what makes this board so durable and user friendly is the thickness. The ISLE Airtech is a solid 6 inches thick, meaning you’re standing well above the water when you paddle. Other boards are only 4 inches thick and sit lower in the water giving one the sensation that they’re sinking or that the board can’t handle their weight. This is also what makes it a great board for all skill levels and makes it ideal for lakes, river runs, or small waves. Being slightly more elevated above the water makes for a higher center of gravity that isn’t as conducive for whitewater, choppy waves, or medium surf. While the manufacturer lists the max weight limit at only 240 pounds (significantly less than some of their competitors, it must be mentioned), many users had no trouble maneuvering and paddling with extra weight. Some even had up to 400 lbs on there from having two people on and said it was fine. Despite the various proclamations that all the extra weight was fine, I think what is meant is that the board still floats and you can get from point A to point B. Speed and maneuverability will be significantly compromised, but for those using the board casually or socially, the loss of those attributes is probably not a huge concern. As one can expect, an inflatable paddle board is fairly lightweight. Newly improved, the board weighs in at only 18 lbs due to its Fusion-Lite construction. Since it is in inflatable, you can inflate the board just a few feet away from where you’ll be paddling and carrying it around shouldn’t be much of an issue if that’s a concern for some. While the ISLE iSUP is sold with a high quality manual pump, many have opted instead for an electric pump to facilitate the process. Pumping manually to reach the full PSI of 15 takes about 5-10 minutes with most users commenting that reaching the final few PSI is rather strenuous, but with some enjoying the pre-paddle warm up. This problem is not unique to ISLE, however, and will be an issue no matter what iSUP you purchase. Lastly, one of the other great features of this board is the deck mounted bungee system that can be used for carrying extra items with you. Stow a towel, a dry bag with important gear, water bottles, or even clip a carabiner to it for smaller bags or boxes containing keys, wallets, or cell phones. All in all, there’s not much to dislike about this board. Its size and chunkiness does take away some of the speed and maneuverability, especially if you exceed the maximum weight limit of 200 lbs. But the people who are buying this board are usually not too fussed about those things anyway. Given all the extras that come as part of this package leaving literally nothing else to be purchased if you don’t want to, this is a great deal for those looking to get a start in the sport of paddle boarding. Next in the running for best iSUP is the Tower Paddle Board. Tower is another reputable brand name in the paddle board world. Their board is slightly smaller than the ISLE board and offers some of the same features as their ISLE competitor: military grade construction materials, 2 year warranty, and extreme durability. There are only a couple of minor differences between the Tower iSUP and the ISLE iSUP, but these might make or break one’s decision to go with this board over another one. First the negative: the Tower iSUP package does not come with the convenient carry bag that ISLE does, which is not an insignificant selling point for some consumers. It does include a manual pump and adjustable aluminum paddle, however, just like ISLE. Another big difference, probably the biggest, is that this board also does not include the front on-deck bungee system that ISLE offers for strapping down other items while paddling. Once again, this is not an insignificant selling point, especially because there does not appear to be a satisfactory way to mount one yourself after the fact either. On the plus side, this board is rated for a maximum weight capacity of 350-400 pounds, almost double what the ISLE board’s maximum weight limit is. While many users of the ISLE board remarked that they were able to use the board above its maximum 200 pound capacity, presumably the Tower Adventurer board can take on such a load without significantly impacting its speed and maneuverability. Both have the 6 inch thickness which elevates one a few inches off the water for greater stability. The Tower board also weighs in at about 25 pounds and its 9 foot 10 inch length is only 2 inches smaller than the ISLE board. Made with beginners and families in mind for flat water paddling. Given the similar price points between the Tower Adventurer iSUP and the ISLE Airtech iSUP, the little things could make a big difference. In this case, Tower’s lack of an on-deck bungee system or included carrying case, both features of the ISLE iSUP, might tip the balance to ISLE. The one significant difference between the boards, the weight limit, is not a deal-breaker and has not been a huge factor in the enjoyment or satisfaction of one board over the other. The vast majority of users are still very satisfied with their Tower iSUP. But all things else being virtually equal, the extra little features offered by ISLE make their board just a teensy bit better value for the money than the Tower board. While the Tower and ISLE boards were both quite similar, the Solstice Bali iSUP is a bit different from the two of them. First off, it’s a much longer board than either of the previous two at 10 feet 8 inches. Even though it’s longer, it still weighs approximately the same at around 25 pounds. This is probably due to different construction materials from the other two, utilizing 3 ply PVC reinforced fabric material. Ready for your summer Solstice? Amazon has great deals on the Bali SUP. It’s also not as thick as the other two boards being only 4 inches thick versus the 6 inch thickness the other two offer. This is a drawback for some who prefer the higher elevation off the water so they don’t feel like they’re sinking or that their belongings will get wet while they paddle. One user stated that it “…definitely has more flex than I would like”. Additionally, this board comes with an accessories package that differs from either of the other two. Most significantly, the Bali board does NOT come with a paddle. It includes a pump, just like the other two, a carry bag, like the ISLE iSUP, and a center fin which both of the other two offer as well. The lack of a paddle probably explains the significant difference in price. The Solstice board is $200-250 cheaper than either of the other boards. This gives you a fair bit of wiggle room to play with to find a paddle that suits you but still be able to spend less than the total package of either of the others. While this board does not have an on-deck bungee system like the ISLE board has, it does include 4 stainless steel tie downs which you can use to mount your own system for securing extra gear. This makes a nice middle ground between the on-deck system that ISLE provides and the complete lack of one (and even way to mount your own after the fact) on the Tower iSUP. Bottom line: If you want to spend the absolute least amount possible on a paddle board, this one will get you by. It has mostly favorable reviews and offers just enough to make it a good value but without all the bells and whistles other boards come with. The three boards presented here already represent three great quality boards with highly favorable reviews. Any of the three would make a great board, especially for beginners. #1) ISLE Airtech Inflatable Stand Up Paddle Board– Great accessories package included, well constructed board, great reviews. What sets this one apart is the on deck bungee system, which none of the other boards offers. The only negative is the 200 lb weight limit, but many users stated it’s not a problem. #2) Solstice Bali Stand-Up Paddleboard– The cheapest of the three by a long shot, it still offers a handful of extras that make this board a winner. Beware, there is no paddle with this board but you can buy one separately and still not spend as much as you would on one of the other two. #3) Tower Paddle Boards Adventurer– If you’re a big guy and need a board that will support your weight, the Tower board will be your best pick. Otherwise, this board lacks a couple of crucial features, like an on deck bungee system or way to mount one afterwards and no carry bag included in the package to make it worth the price. With no corresponding reduction in price to offset these missing features, it ranks behind the other two boards in overall value for money.